Modern information and communication technologies play a fundamental role in the activities of an organization like Historic Hotels of Eureka Springs. 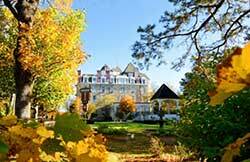 We are based in Eureka Springs, AR in the United States of America. We do not collect information about our visitors from other sources, such as public records or bodies, or private organization. Sending an e-mail to (oblast@basinpark.com) whether we are keeping personal data about you. Upon request, which you can indicate by: Sending an e-mail to (oblast@basinpark.com). We will provide you with a readable copy of the personal data which we keep about you, within a week. - although we may before require proof of your identity. We will provide the information without any charge.